Jiloca Industrial, S.A. manufacturing facilities are located in the locality of Santa Eulalia del Campo, in the plains of the province of Teruel (Spain). Its location obeys reasons among others, to the advantage to take profit of constructions and infrastructure property from Ebro Foods to which we belong. Inside this complex, we have at one side the building which lodges the offices from where all the administration and the logistics of the company are managed, the factory itself and the laboratory. The destined zones to manufacture our products are distributed with the following functions: Warehouse for the reception and storing of raw materials, warehouse with the formulation and packaging equipment, and finally the installations for the finished products storage and packages stock for its packaging. Between the elements of our factory infrastructure we can find three great deposits for the liquid products storage. With them we facilitated the supplying of great amounts of raw material, to ensure the continuity of the manufacturing and by extension the guaranteed service to our customers. Jiloca Industrial, S.A., counts within the factory installations with its own laboratory, where our chemistry performs the pertinent analytical for the quality controls. These are realized on the raw materials as well as on our manufactured products. 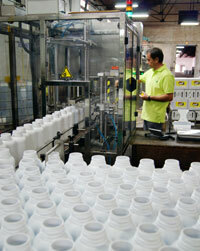 Also continuous controls are performed in order to guarantee the quality in all phases. Periodically or simply when the circumstances it requires the external services of credited laboratories are contracted. 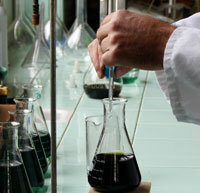 Our laboratory is part of our I+D area, working in the elaboration of formulation for the development of new products. These, later, are tested in field to obtain all the possible information and transfer it to the producer if the product comes into the market. – RD 506/2013 manufacturer certified: JISA, complying with regulations on fertilizers, is certified as agronutrients manufacturer by Bureau Veritas certifying. – Reach registration for Humic Acids: Since 2012, JISA obtained the new European Registry Reach as Humic Acids manufacturer. – Teruel Company Internationalization Award 2013. 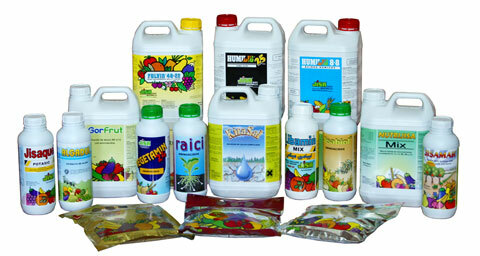 – Founder member of AEFA (Spanish Association of Agronutrients Manufacturers). Since its beginning, Jiloca Industrial, S.A. maintains its vocation to be a leader in the manufacture of products bound for agriculture, mainly agronutrients: organic soil improvers, humic acids, fulvic acids, amino acids, chelated microelements, bio-stimulants, soluble solids N.P.K., etc. “Estamos por la labor” We are here to collaborate! For this we counted mostly with the advantage of own raw materials coming from the different activities that form the solid group to which we belong. “Estamos por la labor” (“We are here to collaborate”) is the slogan that distinguishes us, and this is possible because we have a highly qualified and enthusiastic team, which always works to attend the needs of the fields, solving the problems that our customers raise. Our business office is located in Valencia (Spain), and the factory, placed in the town of Santa Eulalia del Campo, just thirty kilometers from Teruel (España). It is equipped with modern manufacturing equipment, R&D and its own laboratory. Jiloca Industrial, S.A. continues to develop new nutritional products, attentive to changes in the globalization of supply and demand, as evidenced by continuously international commercial. In this sense, we currently have a large and qualified dealer organization throughout the Spanish territory, as well as strong importers in several countries, granting to us a high exportation level. This international expansion also has allowed us to provide our customers (importers) a methodology and set up of the necessary logistical support by the export department. This, facilitates the information and advice necessary to monitor the legislation of each country and its bureaucratic paperwork for the export, great value aspect to trade effectively and fluid into the target companies. Trademarks like: Fulvin, Humilig, Jisaquel, Libamin, Jisamar, Tarssan, Cristaljisa, Jisafol, Humivita, Vegetamin, Algadul, Kitasal, Cuajemax, Cuproactiv, Engormax and Molex among others, enjoy máximum international recognition for quality, results and agricultural yield. Jiloca Industrial, S.A. taking the commitment for the future on quality, transparency to the farmer and environment respect.